I've been a member here for a while now, and have played about with some ideas for various things, all of which have been overtaken by pressure of work (which I'm quite glad of in these nasty times). I pop in and out, look at the excellent modelling, then think "one day I'll..."
Today, however, my sister in law asked me to replace a toilet seat for her. No problem there, but the old, wooden one caught my eye. I'm certain it's been done before, but the idea of a micro layout on the lid was born. What I'm thinking of doing is removing the hinges that hold the lid to the seat, also removing the plastic spacers that keep the lid off the seat (this sounds really complicated, but I'll explantory take pictures tomorrow if I get a minute - the whole thing is in work as the mrs would go mental if this came home), and using discreet wooden blocks to act as replacement spacers, make one unit out of seat and lid, so there can be no doubt as to the origin of the thing. Then, construct a micro layout on the lid, more than likely in GNine, with a very short train running around a circle of track, through either end of a building, possibly with an automatic stop. Though as you'll note it was sadly never finished. I should avoid all sorts of track laying woe by using the lid, and the whole thing being made of wood. 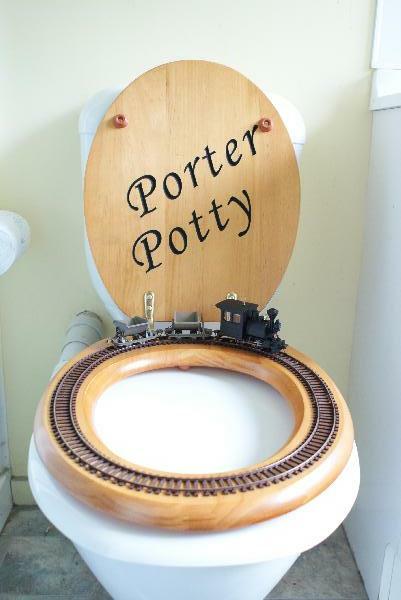 Or a 'Porter Potty' perhaps? It raises many comments at Exhibitions. "Where were you when you thought of it?" "Is this Scale Bog Standard?" "Is there any significance that the Loco is pulling a 'Log'?" (just realised that this photo doesn't have the 'Log Wagon' attached). Most people however, don't get the pun in the layout name. John, thanks for the link, I like the idea that the great man was dismissed from court for telling "risque stories". I rather think I'd like him. Murray, thats an excellent picture & concept. To have it pulling a log or two would certainly make me laugh. Hard to believe that its 3 1/2 years since this one got a look! I'm in a "making stuff" way of going this last while, and when tidying up a much unloved corner of work yesterday came across the toilet seat originally proposed for C Rapper and Sons. I'd originally thought of Gn15 for this one, then found out about (and bought) a circle of Tomix N gauge track. So, GNine it is. 1:24 dolls house bathroom equipment is also easily available, so this could end up quite funny (at least in my head). Photos to follow, and on re-reading this thread an On30 "logging" line as proposed above may also get a go. I'm thinking of the lid at a slight angle made to look like a hillside being cut down. Bit more room than I thought, so may well make it an oval (with a bit of it hidden in a building to disguise the ovality) or maybe a point and a very short siding. I'm thinking of Peco 009 track as the Tomix track won't look right. The tramway track from Tomix can look better than the sleepered track. Might also be worth looking at the road system as well, as one idea I have is for works trolleys moving around a factory. A works yard is more likely to have inset track. Points? , well could look at my 3D printed items, as already quite a bit for 9mm gauge, and I am open to suggestions. I note that you plan to angle the lid. Before permanently fixing track make sure that you don't get derailments on the curves with whatever you intend to run. Just checking a Loco isn't adequate. Many moons back a layout didn't get completed for that reason. Simon - Agreed re inset track. I'm intending to use the Tomix tramway (or similar, and I've yet to look properly at your range, but will be in touch regarding it), the track shown is just to get an idea of the thing and what will fit where. Gerry - the angled lid idea had been scrapped, for precisely the reasons you give! Slow progress as I've been giving my workbench a very long overdue clean and tidy. I've been doing a lot of baseboard making for the last while, so decided to crack on and make the lower frame for the toilet seat this morning. Not exactly hard to do, but it progresses the job a little further. Next is to find some metal polish, and give the hinges a good go, as they've become tarnished with sitting around. Then to fit the lid a little more permenantly, and give it a bit of a sand to get the top coat of varnish roughened up, then I can think about laying some track. Thanks Lesmond. What rolling stock are you using? I just may get back on track to work on my G9 stuff. The Kato track I have is also inset but I want a concrete or asphalt floor. I've not decided yet about rolling stock. For ease and speed I'll probably talk nicely to Steve Bennett, his Pepper 7 range has some lovely G9 bits, although I do have enough dead and critically injured N gauge stock to knock something together. Really all I need are a small locomotive and two or three flat cars to carry dolls house bathroom fittings. Did you say you would 'crack on' with the toilet seat layout? Thanks Ken, and I did indeed say that, although it truly was unintentional . Its made me laugh this morning though.